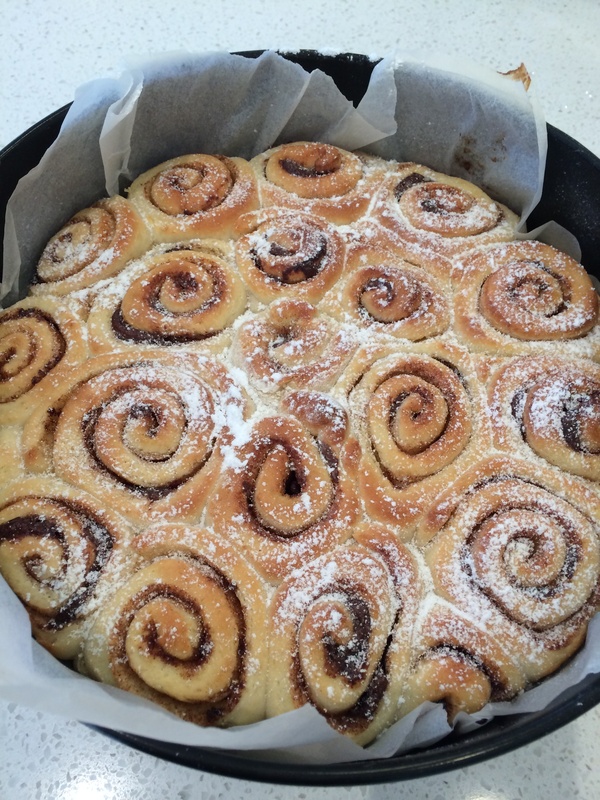 Used Annabel Langbein’s sticky bun recipe from her website. ( link below) for these nutella scrolls. Definately a treat, nutella and sugar and cinnamon. Ran out of milk and used 1/2 coconut milk, still worked great. Add 125g butter and 490g milk to TM bowl. Heat 2.5 minutes, 50C, speed 2. Until butter melted. Add one a sachet of dried yeast and 100g sugar. Heat 2 mins, 37C , speed 1.5. Leave 10 minutes, till yeast appears frothy. Add 846g (6cups) flour, tsp salt. mix 6 sec on speed 5 first then, Knead 3.5 minutes dough mode. Place dough in a large pot, I place pot in warm water for around 1 hour till dough has doubled in size. Halve dough, place one in fridge/freezer for use another day. Follow instructions in recipe link above for rolling out, filling and second prove.